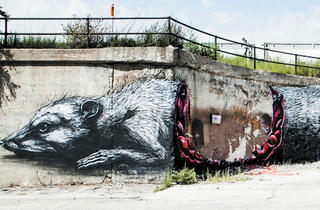 Pawn Works curates Art in Public Places for Ald. Solis. Photograph: Brock BrakeGaia, Quetzalcoatl and the Stork, 2012. Photograph: Brock BrakeRoa, Untitled, 2012. Photograph: Brock BrakeReyes78, Untitled, 2012. 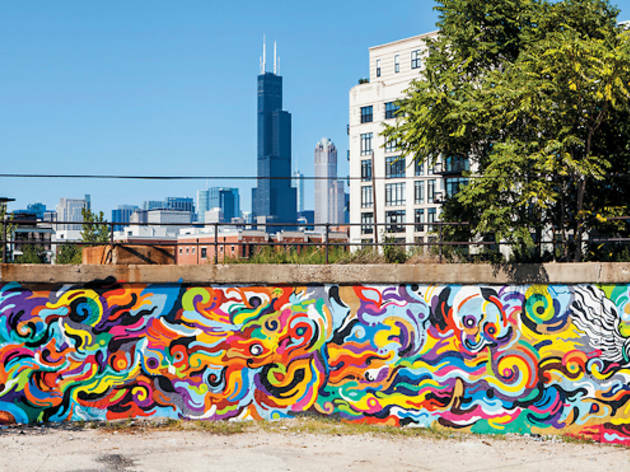 Thanks to Art in Public Places, new murals along Pilsen’s 16th Street are doing double duty as urban renewal and an alternative to illegal graffiti. 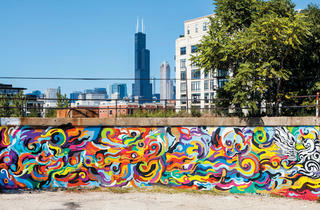 The Chicago Urban Art Society organized the initiative in conjunction with Ald. Danny Solís’s office. But the task of recruiting internationally renowned street artists for the permanent project—including Reyes 78, Jon Burgerman, ROA, RAE and Gaia—fell on its cocurator, Ukrainian Village’s Pawn Works Gallery. 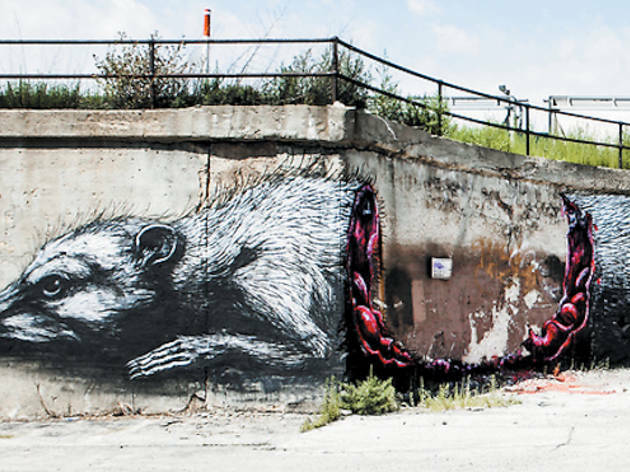 “For us it’s all about getting work on as many walls as possible and boosting Chicago’s position in the international [street-art] scene,” says Pawn Works cofounder Nick Marzullo. The jewel of Art in Public Places is Gaia’s Quetzalcoatl and the Stork, a piece inspired by Pilsen itself. 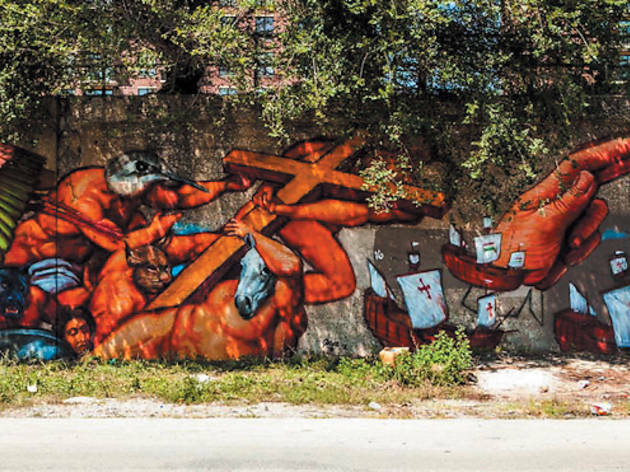 “I try to work as specific as possible and respond to the neighborhood,” the street artist says by phone from Baltimore, where he graduated from Maryland Institute College of Art in 2011. “I promote work that appreciates and respects—and maybe even challenges—the environment.” Gaia (a pseudonym) frequently uses animals as motifs in his signature black-and-white wheatpasted drawings. He recently began taking on larger painting commissions across the U.S. and in Europe. Quetzalcoatl and the Stork draws from the Catholic faith shared by Pilsen’s Polish and Mexican immigrants, blending biblical figures with a mash-up of the two communities’ mythological traditions. “There’s an interesting correlation between those cultures,” says Gaia, citing shared histories such as “being new in America, Roman Catholicism and definitions of whiteness.” He observes that people of Polish and Mexican descent share the same neighborhood in Baltimore as well. The first section of Gaia’s mural appropriates the dramatic poses of Michelangelo’s God from the Sistine Chapel’s Creation panels. Garbed in brilliant green, a figure from Mexican myth with the head of a hummingbird is part of a composition that tells the story of immigration and Catholic evangelism in its depiction of ships sailing toward America and Pilsen’s St. Adalbert church (1650 W 17th St), which conducts Mass in both Polish and Spanish. Other symbols include the Mexican serpent god Quetzalcoatl and the child-bringing white stork of Slavic mythology. Gaia’s involvement in Art in Public Places stems from his joint show at Chicago’s Maxwell Colette Gallery and Pawn Works in March 2011. “I love Chicago,” he says. “Since then, I’ve been looking for an excuse to get back out there.” When Marzullo and Pawn Works codirector Seth Mooney invited the artist to do a 25th Ward mural, he studied the neighborhood’s history. 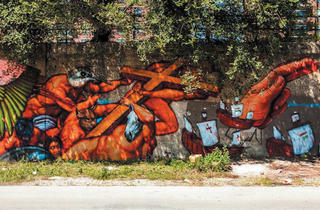 In August, during the week he painted the mural, Gaia enjoyed a strong reception from locals. “People thought I was Mexican,” the dark-haired, part-Italian artist recalls. “I think any gesture to understand an environment is appreciated.” Capitalizing on his presence here, the owners of West Town’s NiNi’s Deli (543 N Noble St) asked Gaia to paint a mural on the store’s facade. Solís presents a free trolley tour of Pilsen’s murals Saturday 20 and Sunday 21, noon–5pm, beginning at the CTA’s 18th Street stop.